MCH ceramic plate heats up to 450℉/230℃ and releases negative ions to make hair shinier and smoother with this hair brush straightener. USpicy Hair Straightener Brush is amazing! I have super long hair right now and this USpicy Hair Straightener Brush saves me so much time. I love that it brushes and straightens because it saves me an entire step in my routine which saves me time. As a mom of 4 I love anything that saves me time. I also love that this USpicy Hair Straightener Brush has seven temperature levels ensuring there's one that just about prefect for everyone out there. I usually use the lower setting but if I really want to ensure that my hair is straight and stays that way I'll use the higher temperature. This is also nice because then I'm not using high heat on my hair everyday which will keep it healthy. Another great feature is that this USpicy Hair Straightener Brush automatically shuts off after 30 minutes which is terrific because I never remember to turn things off. 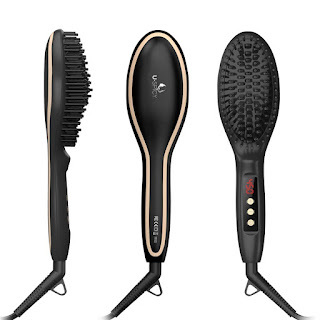 This USpicy Hair Straightener Brush is wonderful and I highly recommend it! USpicy's Nail Buffer and Polisher is awesome! I love how quickly this little tool cleans up my nails. I'm a pretty simple girl so I love natural looking nails. With USpicy's Nail Buffer and Polisher I love that I can achieve a natural look that looks perfectly manicured like I just left the nail salon. The two speeds work great to shine and buff away all scratches and ridges leaving me with a clean, polished and healthy looking nail. I also have to add that having a clean nail that is polished and buffed helps nail polish go on much smoother and easier so if you ever want to polish your nails, this USpicy Nail Buffer and Polisher will help make polished nails look awesome as well. I highly recommend this USpicy Nail Buffer and Polisher! Huge Volume - This diffuser has 300 ml capacity water tank which provides up to 8 hours of continuous mist time. Smart Timer - 1 hour, 3 hour, 6 hour timer, and continuous mist mode for your to choose in this essential oil diffuser. Mood Lighting - 7 colors in 3 hues create a light kaleidoscope to match your mood with the oil diffuser. Quiet and Safe - Works in silence and shuts off automatically when water runs out. It is very safe to use the cool mist diffuser. Customized Misting - Strong and light mist output for different occasions and preferences. 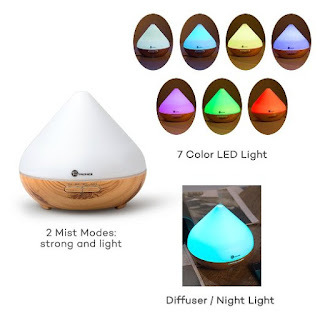 I absolutely love this TaoTronics Essential Oil Diffuser with Cool Mist and 7 Colors! This is seriously such an awesome product! I've really gotten into using essential oils so I love that I can add a few drops of essential oils into this TaoTronics Essential Oil Diffuser and the essential oils are distributed throught the room. I also love that this TaoTronics Essential Oil Diffuser holds 300ml so it lasts through the night without needing to be refilled. It also disperses cool mist throughout the room which is great especially if you live in a dry climate like I do. Then, there's the lights which are absolutely perfect for using in a child's room as a night light. There's 7 different colors so your child can pick a different color everyday of the week if they'd like. This TaoTronics Essential Oil Diffuser is also super quiet and puts out just the right amount of mist. This is a wonderful diffuser and I highly recommend it!